Israel-based Sckipio, which helped to build some of the kit that Openreach (BT) piloted as part of their 330Mbps G.fast broadband rollout, has today demonstrated over 3.1Gbps of download speed (900Mbps upload) on production silicon using G.fast bonding at 212MHz. Last month the company took a big step forward after they became one of the first to launch a chipset based off the ITU’s new Amendment 3 to the G.fast standard (here), which doubles the spectrum frequency to 212MHz and also supports other changes like coordinated Dynamic Time Allocation (cDTA). Today the company moved to demonstrate some of these improvements at the Broadband World Forum event in Berlin (booth E101C), where they teamed up with software company Civica. The setup involved two bonded pairs of CAT-3 wiring (“regular copper telephone wires“) in a network that should in theory be able to hit a top speed of 4Gbps (Gigabits per second). The demonstration used Sckipio’s new SCK23000 chipsets, Civica’s WanStaX software and the Microsemi WinPath network processor. But crucially we are not given any information about distance (how long was the copper line?). Openreach’s recent Fibre-to-the-distribution-point (FTTdp) based test of pole mounted G.fast distribution points from NetComm Wireless also made use of 212MHz to achieve Gigabit class speeds (here) and bonding could certainly take such performance further in the future. However at the moment the technology is somewhat hobbled by its limited port count (up to 48 per cabinet, rising to 96 in the future) and ordinary consumers tend to be discouraged by the high pricing of bonded solutions, which is why they have remained more the preserve of SME business connectivity. lets hope they release some distance/speed info. Would be very tasty if we could get 1Gbps connections using G.Fast. Technically you could get close to 1Gbps (aggregate speed) with even the first generation kit, but they’d have to support the profile and the cabinet would need to be pretty much right outside your house or in very close proximity on the same street. Scroll down a bit on this page for some distance estimates (as the crow flies). haha, that old gFarce donkey again. https://neil-fairbrother.squarespace.com/blog/2013/7/1/gfast-a-high-speed-cul-de-sac – it just shows nothing is too much trouble to preserve the antiquated copper network for the masses and let a few go faster for a price. Hahaha, that 4yr old article again. Just goes to show how wrong Neil was at the time. I’ve left a comment on that blog. It’s something of a mutual admiration society, and I’ve pointed out that it’s all very well going on about the very well known characteristics of copper transmission lines and the merits of fibre, but that the really difficult problem isn’t the technical one (fibre is not difficult in principle), but that the vastly more difficult issue is how to make the commercial business case work for comprehensive FTTP coverage, especially in the UK regulatory enviroment. Strangely, the B4RN business case is very strong on that issue, but that doesn’t seem to have percolated through. Clearly the Aussies think that the copper network can work for them, where appropriate, in a commercial business case. I remember you telling us each B4RN customer gets a dedicated 1G to Manchester, is that still the case? The Australian NBN is a great example of not to sweat the last out of the existing infrastructure. It didn’t help the terrible condition Telstra has left the existing copper in (joint gel, plastic bags, etc) and the Australian standard copper gauge is thinner (0.4mm) then most around the world. 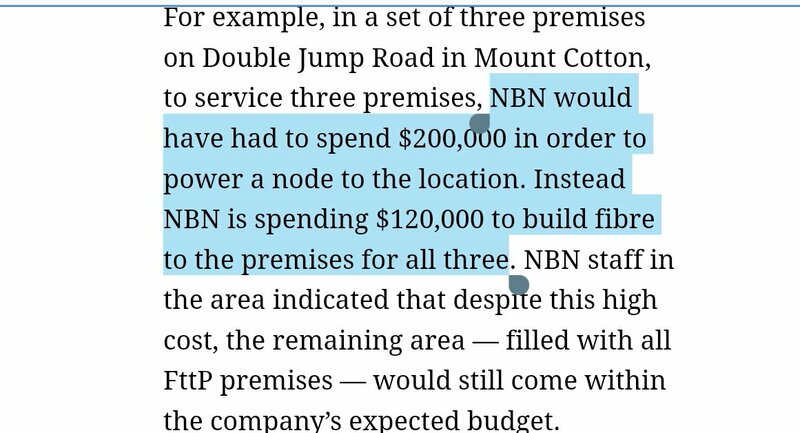 The NBN has become one of Australia’s largest political footballs in history, the article linked is disingenuous with their “top 50” most expensive FTTP costs. Some of the sites on that list where known to be cheaper to rollout FTTP than go down the path of using FTTN (https://pbs.twimg.com/media/DM2_KeXU8AA_oF0.jpg). Each B4RN customer gets a gig symmetrical. Not that anyone can use a gig yet, or even measure it. Only a few very clean fast computers get a good measurement on speedtests. Every line installed is tested and delivers a gig when tested. Most folk use wifi though, so they can never test a gig, the best score on wifi up to now in a house is 800meg. The best on phones is about 500 meg. The record for the number of streaming gadgets on one b4rn connection (via 4 extra access points in the room) is 215, and we simply ran out of gadgets, dunno how many more we could have streamed with. And many were updating their OS with a gig windows update at the same time. I am not technical, but does that answer your question? Sounds like a no to Gadget’s question then. I thought it was 10G shared by all users on each villages cabinet. That depends on having enough WDM wavelengths … which might start to run out as they expand sideways to more parishes. 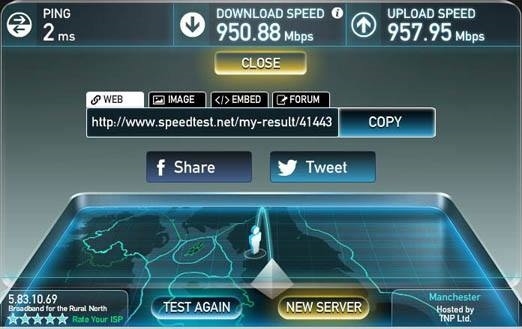 It does, however, sound like the killer app for gigabit speeds is the speed tester. The bottleneck is not computer speed. It’s 1gig Ethernet. You’d need to be using a faster than 1 gig Ethernet in order for usable throughput to fill up 1gig, due to overheads in packet transmission. Sadly 2.5 or 5 gig Ethernet is not gaining any traction. Isn’t the driver for 2.5 and 5G Ethernet the ability to service the top WiFi access points? Presumably only when those nodes are separate from the router, such as enterprise rather than home. In my experience, WiFi writes cheques it can’t cash. Over the span of 2 years, I went from “I don’t want wires” to having everything that doesn’t move wired in. Wifi sounds good on paper, bbut come crunch time, nothing yet beats Etherne. Admittedly, 1G Ethernet is fast enough for 99.99% of my needs (mostly my 200mbps Internet and 4TB NAS), but at reasonable prices, I’d upgrade my equipment out of sheer excitement. I also read that Huawei were demonstrating 20Gbps over 4 bonded Cat5 lines, using G.mgfast at 424MHz. 5Gbps per line, good for 30m apparently. Also works at 100m, but with unknown speed. Phone lines may get 90% of this. The performance of G.mgfast perhaps shows that G.Fast is indeed a cabinet, node, or street-level product (Sorry NeilF) and that G.mgfast is the right standard for DP deployment. I see that Nokia have released a 16-port G.Fast DPU that has proper reverse power built-in. That’s also a serious contender for DP deployment. The final drop is becoming competitive in other ways too. Nokia seem to be pushing fixed-wireless components there too – using mmWave on either 5G or 802.11ad. This looks like the direction Google Fiber might reform around. It’ll be warm in there, no doubt.